I’ve had this issue for a while, where the sound will randomly crash while working on a video. Then I just here a brief crackle followed by silence whenever I hit play. I’ve been able to resolve it by closing and re-opening the file. However, today I am unable to get any sound at all. I open the file and when I hit play it crackles briefly, then silence. I’ve updated to the latest version of Shotcut, but no change. I’ve checked the forum but couldn’t find a related thread. Any idea what might be the problem and how to fix it? I’m on Windows 10 with a Dell-PC. Many thanks in advance for any tips! I’ve updated to the latest version of Shotcut, but no change. Also what kind of audio file are you working with? Is your project just audio, is it audio that is inside a video file or are you adding an audio file to a video? More details are needed. Hi there! Thanks for your reply! It’s shotcut-win64-181118 and previous versions. I am working with an mp4 that includes audio. All projects have been like this and I experienced the problem on various, if not all. The developers have no idea what the problem is or how to fix it because we are not experiencing it. You are the first I hear to report this problem. Hi there, I just figured out it seems to be the limiter causing it. I removed all filters and then added them one at a time and whenever I activate the limiter, the sound crashes. Any idea what the issue might be? I’m now also experiencing a problem with a different file that crahes on opening. It consists of several mp4-clips totalling almost half an hour. I was editing it with no problem, then suddenly it closed and I’m unable to re-open it even long enough to check any settings. Have you heard of this before? My laptop is a Dell Inspiron 17, Intel Core i7-7500, 16GB Ram, Windows 10 - it should be able to handle it, right? I’m wondering if the problem could be linked to the filters here too - I was just busy adding them when the file closed the first time. I just checked the error log and there’s a long list of filter mentions - filters I haven’t even used. The ones I use are low pass, high pass, compressor, limiter and gain. I’ll include the error log in case it’s helpful. [Info ] plugin_mgr_get_object_file_plugins: error opening shared object file ‘C:\Program Files\Shotcut\lib\ladspa/AUTHORS’: “C:\Program Files\Shotcut\lib\ladspa\AUTHORS”: Das angegebene Modul wurde nicht gefunden. [Info ] plugin_mgr_get_object_file_plugins: error opening shared object file ‘C:\Program Files\Shotcut\lib\ladspa/COPYING’: “C:\Program Files\Shotcut\lib\ladspa\COPYING”: Das angegebene Modul wurde nicht gefunden. [Warning] [ 0x6fed0a0] The DeckLink drivers not installed. The ones I use are low pass, high pass, compressor, limiter and gain. If you can describe what order in which you use the filters and what the settings on, I will attempt to mimic what you’re doing to see if it’s the same for me. My laptop is a Dell Inspiron 17, Intel Core i7-7500, 16GB Ram, Windows 10 - it should be able to handle it, right? Your computer should be fine to handle it. Are all of the files on your computer? I know there has been issues with people trying to edit from a USB drive can cause issues. Also make sure those files are not open anywhere else on your computer. Does your Source fps match up with your Video Mode? Does your Audio selection match up with your Audio Channels settings? Despite what you hear in the Shotcut player, have you tried to export it? 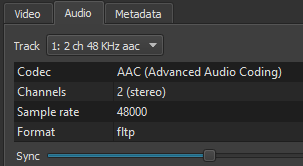 Is there sound after exporting? I use the filters in the same order as listed above: low pass, high pass, compressor, limiter and gain. All the files are stored on the computer’s hard drive. The video mode is set to ‘automatic’ and the audio matches (2 channels). Now I just exported the project in YouTube format and there is no sound at all. I could not duplicate the issue. You didn’t provide any setting of the filters, so I just had each one at default. Sorry for the lack of video quality, forgot to set OBS higher for this screen record. Hi there! Thanks for looking into it. I’ve tried various settings and they don’t seem to make a difference. The problem is resolved when the limiter filter is removed. Perhaps it’s this filter that is somehow broken locally on my pc… ? Is that possible? Is there a way to update just the filter? I’ve re-installed Shotcut twice already but the problem persists. Or would it be linked to my audio driver (which I’ve also already re-installed)? Or any other idea what to look at locally that might be interfering? I think compressor alone should be able to accomplish the combination of these three. With that said, I was not able to reproduce the problem. Perhaps it’s this filter that is somehow broken locally on my pc… ? Is that possible? Unlikely. There are a huge number of variables in a digital media project that can combine in ways that can result in bugs that are difficult to reproduce and fix. Hey, thanks a lot for looking into it!